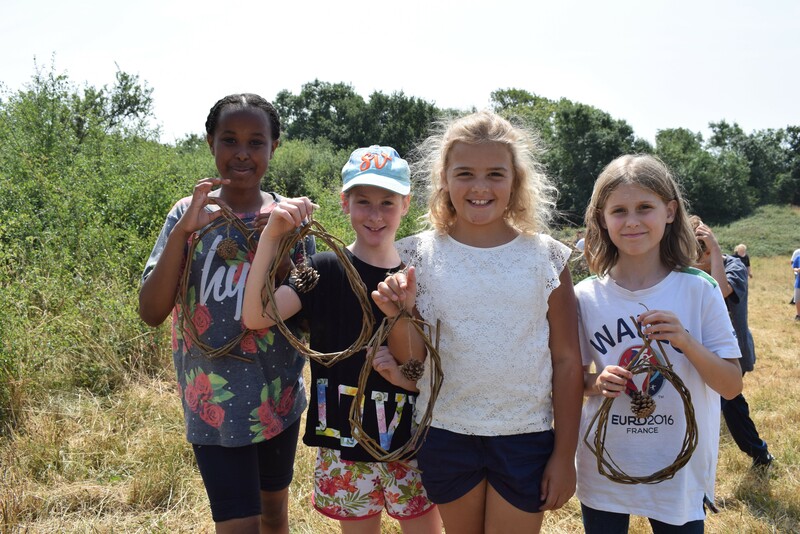 Local primary school children slathered on the suncream and brought their inquisitive minds to a hospital site to learn about nature and the environment. Llandough Primary School attended Our Orchard, a unique project at University Hospital Llandough (UHL) during the height of the summer heatwave to take part in bird watching, willow weaving and filling the purpose built bug hotel. The children were also treated to an entertaining talk from Our Orchard Ambassador Dr Rhys Jones who was inspiring during his talk about his travels to Africa and in teaching the children about the wildlife and plants that were home at Our Orchard. The children got to explore the seven acre area which will be home to a semi-natural planted area which has been set aside for the protection of plants and wildlife, wildflower meadows and a bee sanctuary. Our Orchard is a unique space at UHL which will become a legacy for generations to come. It will be created on seven acres of semi-rural pasture land and woodland which makes up part of the UHL estate. This will benefit patients, staff, visitors and the wider community and will be funded entirely through donations made to the Cardiff & Vale Health Charity. No NHS funding will contribute to the development and maintenance of this unique outdoor space.